Outreach to those in need in our community is an important part of Dunwoody UMC’s mission and vision. Our members are often joined by the community to serve in local mission projects and share God’s love with the least and lost. 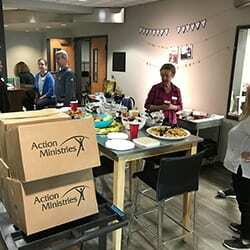 In local missions, we make a difference at home with projects ranging from assembling food packages at Foodstock to the annual DUMC Holiday Festival. Whether you are looking for a one-time volunteer opportunity or an ongoing experience, you can find many ways to serve others in our local missions projects. Dunwoody UMC partners with Rise Against Hunger and Simpsonwood UMC to assemble 300,000+ dehydrated meals for children in need across the globe. More than 1,200 community volunteers participate in this event in August. Volunteers form assembly lines to bag the meals of rice, soybeans, vegetables and 21 essential vitamins. We fill an entire shipping container with 20 tons of food that is immediately shipped to those in need. Over the past nine years, we have packaged 2.5M meals. In 2018, DUMC was the site of the 100th million meal packaged with Rise Against Hunger by the United Methodist Church nationwide. For more information on Dunwoody UMC’s Foodstock, CLICK HERE. Each year in October, Dunwoody UMC hosts Great Day of Service, a local mission opportunity with projects for all ages and abilities. We organize 700+ volunteers in 30 different mission projects. 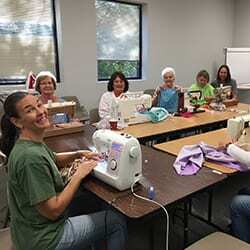 Half of the projects are at DUMC, such as assembling hurricane relief kits or the family-friendly Potato Drop. The remainder are in the community, including Habitat for Humanity’s Brush with Kindness or the Community Assistance Center. In 2018, we successfully completed DUMC’s 30th Annual Great Day of Service. 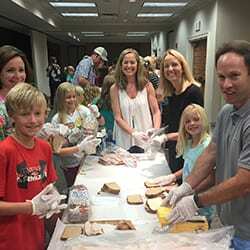 For more information on Dunwoody UMC’s Great Day of Service, CLICK HERE. The Dunwoody UMC Annual Holiday Festival is a one-day indoor event in November that features a juried show of beautiful handmade arts and crafts items by more than 125 talented artisans. It also has a wide variety of other venues, including an online Silent Auction, Attic Treasures, Book Nook, Casseroles to Go, Breakfast, Luncheon, Children’s Activities, Gourmet Shop, Photos with Santa and more. More than 500 volunteers help make this annual event a big success, providing hands and feet for everything from set up to parking to concessions and more. All proceeds from the 3,500+ shoppers benefit DUMC’s Habitat for Humanity project. The Holiday Festival celebrated its 27th year in 2018 and funded the build of our 29th Habitat home. 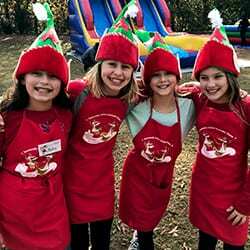 For more information on Dunwoody UMC’s Holiday Festival, CLICK HERE. 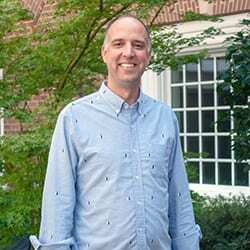 DUMC partners with Wellspring Living to support victims of human trafficking by providing transformative care to those affected. We periodically collect donated toiletry items for victims in a bin next to the Nursery entrance. In addition to collecting items, DUMC has a Human Trafficking Committee that is actively involved in dialogue and actions to address this growing issue. For seven weeks each summer, volunteers gather for Mission Mondays to make lunches for children through Action Ministries’ Smart Lunch, Smart Kid program. About 400 sandwiches are made and lunch sacks packed for delivery to children who typically receive a free or reduced-price lunch at school but may not have access to a lunch meal over the summer. All ages are welcome to help in this weekly summer mission. We also collect donations of sandwich bags, individually packaged chips, fruit cups, juice boxes and water in a bin near the Nursery. DUMC volunteers gather on the last Saturday of the month to distribute boxes of non perishable food to families in need. Each box is purchased from Action Ministries and contains enough food to feed a family of four for several days. A light breakfast of pastries, coffee and juice is served during this time of fellowship and food distribution. Volunteers and donations to help cover cost of boxes are needed. 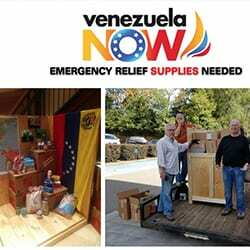 In response to the humanitarian crisis in Venezuela, an organization called Venezuela Now is sending a crate filled with food and supplies to a seminary in Venezuela that will distribute the items to locals in need. We invite you to help fill the crate with basic items like dry beans, rice and canned chicken. The crate will be located outside of the Nursery area April 10 through mid-May. If you have any questions about serving at Dunwoody United Methodist Church or other service opportunities, please contact me. I look forward to hearing from you.